Hey! My name is Rusty and I am old. I know I am old because I read my email. I actually think email is great. You can quickly and easily type full sentences, paragraphs, even use grammer grammar (did I mention spell-check?). But that makes me old because, according to the New York Times, enjoying email is a sign you are old. And that article was written in 2010… so I must be really old. But hey, as a former youth pastor, I already knew this. Why we even sent emails to our students is a mystery. Sure, parents read them and we’re thankful (because the parents are old too), but if it wasn’t on Instagram, Twitter, or SnapChat it didn’t exist to our students. A poll of more than 2,000 middle school, high school, and college students revealed they see email as “a lot of bother,” and perceive reading and writing emails to be like doing homework. That was eight years ago! These students are now the young professionals and families that we, as a church, are trying to reach. We have an entire generation that is quickly going mobile, and will eventually skip the desktop and laptop experience altogether. According to recent findings from the Pew Internet and American Life Project, 91% of teens use the Internet on a mobile device, such as a smart phone. Perhaps more shockingly, according to another recent survey, the number of mobile-only adult Internet users has now exceeded the number of desktop-only Internet users. Yes, you read that right. More adults use the Internet on their mobile devices than on their desktops. Now I really feel old; that statistic was the proverbial nail in my coffin. If your church is like mine, you have people who still read periodicals (and watch VHS tapes). People who still get a giggle of delight hearing “You’ve got mail!,” and those who talk like this: “k cu l8r txt u 2night” (translation for old people)​. How do we communicate to our multi-generational church? Recently, our children’s coordinator announced in service that Vacation Bible School was coming in a few weeks. The problem? Before that Sunday it had only been announced in the printed bulletin. Few people knew about it and only a few students had registered. So, she pointed out the link to the online registration form in our digital program. She even gave permission to sign up right there on the spot with our phones and tablets. People signed up immediately, and by the end of the day, registrations had nearly doubled! Later in the week, she sent an email reminder and the number of registrations nearly doubled again. So what did I learn from this small communication victory that I had nothing to do with? The multi-generational nature of our churches means we have to utilize different methods of communication in order to synchronize people with the vision, mission, and events of the church. One of the reasons I like working with ServiceSheets is because we are thinking about all the channels for effective communication, working to make it as easy as possible to synchronize across the generations in the church. And if you are as old as I am and want to share your thoughts, send me an email. I’ll read it (and might even giggle with delight when I get it). Rusty loves Jesus, his wife Amy, his three kids, and peanut butter. He has worked in the past as a youth and community pastor and now works with ServiceSheets to serve the mission of the church. I’m glad to see the paper bulletin was quickly cast aside as usual. Great job! Thanks for your comment Eric! Yeah, I definitely think paper bulletins serve a purpose, but they just can’t be the primary medium for communicating important information that requires a response, since you are right, most people simply cast them aside shortly after a quick once over at the beginning of the service. I think paper bulletins are more great grandparent than grand parents. Many people like me in their early sixties are grandparents but are completely over paper bulletins and totally into digital connections. Also I think email is still a primary form of communication that is under utilised by churches. 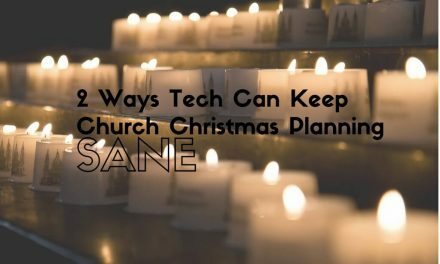 As churches connect with content marketing (and that is just starting to happen) churches will use email on powerful ways. PS I also like peanut butter! Thanks for your comment John! Yeah, we like email. Our church uses Church Community Builder to group our community into common interest groups and small groups which allows us to decrease their inbox clutter and communicate with more specificity and a higher response. Creamy or Crunchy? I really like both with a slight leaning towards the creamy.